Why Choose Our Security & Alarms? Over the past year, Whidbey Telecom has made over 90 gifts of money, time and services to many organizations, programs, and events that help enhance lives in our community members. We've provided several numbers so you can reach the assistance you need right away. Click the button below to view our contact information. Q: Why are my messages missing or out of place from my email mailbox prior to the March 2019 update? A: The new Webmail email is a IMAP client that connects to the mail servers. It is just another client like Outlook, Thunderbird, Old Webmail, etc. If mail is missing than it was most likely missing prior to the update. Q: How do I share out my calendars (via CalDAV)? A: With the launch of the new Webmail email interface in March 2019, customers who had shared out their calendars to other devices via CalDAV can upate as follows. 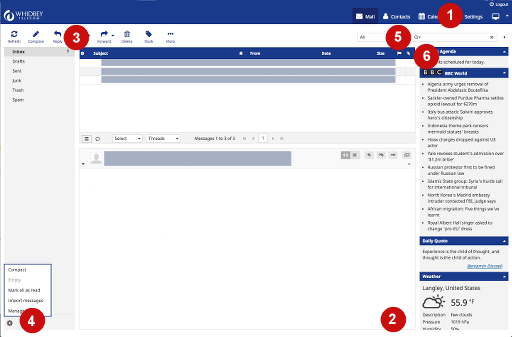 In Webmail email, click on Calendar in the Application Tasks ribbon. In the Calendar Folder Listing hover to the right side of the folder list where the pencil is in the drawing below. The pencil should show up when you hover over it. Click on the pencil to edit the calendar. It will display the URL to add to your remote calendar program in the Your CalDav connections section.